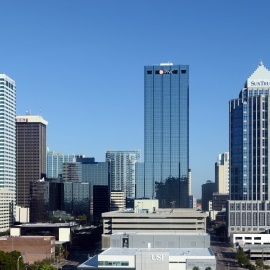 The Downtown Tampa skyline is growing with high rise office buildings like the Sykes building, and luxurious condominiums like Skypoint. The streets below the skyline are where you will find the many great restaurants, shops and bars that Tampa has to offer. Most of Tampa nightlife, along with other areas of interest, is found outside the downtown area in places like Hyde Park and historic Ybor City. Also located in Downtown Tampa are the Tampa Convention Center and St Pete Times Forum, where everything from classy Tampa events to exciting games happen. The University of Tampa is located just across the waters of Curtis Hixon Park, where many large, popular annual events are held. The TECO Line Streetcar provides affordable transportation to Channelside, Ybor City and downtown. Channelside is another popular neighborhood where there are popular restaurants, clubs, bars, shopping and theaters all in the same development! Harbour Island and Davis Island border Downtown Tampa just South onto the Bay Waters and house everything from enormous homes to subtle apartments all while being surrounded by their own small community with locally owned businesses, restaurants and salons. Be sure to check out everything Tampa has to offer by checking out the Tampa City Guide, where recreation, events and even local jobs in Tampa can be found! That time of the year is approaching â summer break for the kids. As a parent, you either love it or loathe it. A common summer conundrum, how to keep your kids entertained and active. Join Tampa Bay Lightning Playoffs Bar Crawl & Party With Downtown Crawlers! Take Our Video Tour of Tampa for Women's Final Four Attendees! Celebrate America's favorite drink, the Margarita, and spend Memorial Day weekend with us at the best festival in Tampa Bay! Enjoy live music, tons of margaritas, games, shopping, great food options, & end the night w/ the largest fireworks show around!